With Water a Broken Pipe is Going To Happen Eventually. 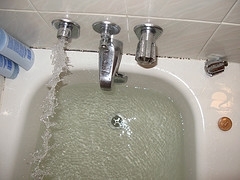 There are several different types of water pipes, at some point in time you will have a broken pipe. 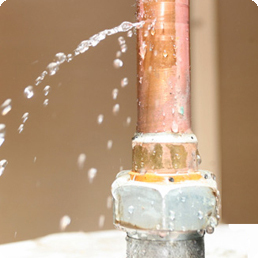 More often then not, the most common leaking broken pipe is the copper water line below the concrete slab. This is referred to as a “slab leak“. If flooring was transparent, you would be able to see the leak. How Do You Find A Broken Pipe Below A Concrete Slab? Because flooring is not transparent, the broken pipe has to be pin-pointed with leak detection equipment, otherwise your flooring could end up looking like Swiss cheese by punching holes in your floor looking for a leak. Imagine when water flows, it takes the path of least resistance when it surfaces. We have seen leaking water from a leaking pipe travel more than 20 feet. After leak detection has found your broken pipe, you are faced with 2 choices. Either jack-hammering the slab to access the leak ” slab leak repair ” or OPT for a whole house water line re-pipe. Some ideas to take into consideration, once copper water pipes start leaking, it’s a sign of more to come. If you OPT for broken pipe repair, several things to take into consideration are location, flooring and costs associated to restoring the affected area. Slab leak repairs are accessed by making a hole in the concrete slab, accessing the leaking pipe and repairing the bad section.